* This is my article in BusinessWorld last March 14, 2017. Traffic congestion is an engineering problem with engineering solutions, not bureaucratic solutions involving increased prohibitions. The recent plan of the Metro Manila Development Authority (MMDA) to extend the car ban on EDSA to certain hours five days a week is very idiotic and arbitrary. Its plan is (a) the existing one day a week, 7 a.m. to 7 p.m., based on the last digit of the car plate, AND (b) on certain hours of the other four days involving an odd-even ban every two hours. If there are problems, the first impulse of bureaucrats with dictatorial tendencies is to create ban-this-prohibit-that regulations and restrictions. If previous prohibitions failed, then create another layer of prohibitions. Based on this new ban proposal, it doesn’t matter if the person has three or more cars because the prohibition is by the hour, not by the day. Although some people adjust to traffic congestion by buying or renting a condo or dormitory room near their offices, others cannot simply afford that option. The latter includes parents and guardians who bring their kids to school first then go to their offices and then pick up the kids later and head back to their house. One day a week car prohibition on EDSA and many streets and cities in Metro Manila is already bad because it forces many households to buy a second car or motorcycle, which further raises the number of vehicles in the metropolis. If one is caught in a long traffic due to accidents or road construction, one can lose the two-hour window and therefore be subject to fines, penalties, and extortion. And to think that the MMDA already gets huge allotments from taxpayers via their annual appropriation while they get more money from the public via endless schemes of fines and penalties. More engineering solutions, not more bureaucratic “solutions of more prohibitions” should be pursued by the government. Consider the investments by other governments in big Asian cities. In the table above, Manila is not included in the study but data from other cities should give us ideas how to provide more engineering solutions. Rail network here includes MRT (Mass Rapid Transit)/Subway/Metro and LRT (Light Rail Transit). The MRT systems in Singapore and Taipei are equivalent to Subway or Metro in other cities. Commuter rail is excluded (see Table 1). 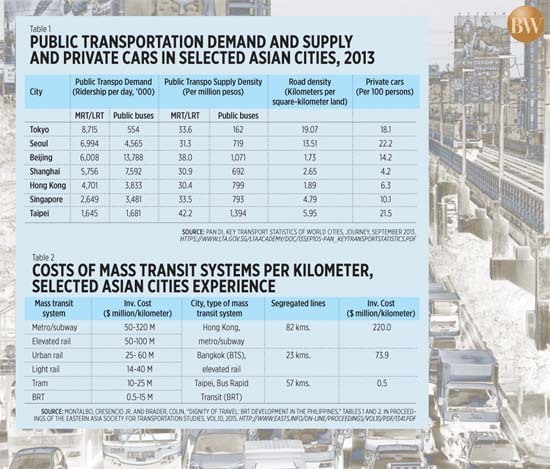 Commuters in Tokyo rely more on rail-based system, those in Beijing rely more on buses. Commuters in Shanghai, Seoul, Hong Kong, Singapore, and Taipei use a good mixture of both. Although the data was collected in 2013, they still reflect current trends. In Metro Manila, the three MRT and LRT networks are obviously insufficient to serve its 12 million residents plus an estimated four million people from nearby provinces of Bulacan, Nueva Ecija, Pampanga, Rizal, Laguna, and Cavite who go to Metro Manila almost daily for work, meetings and schooling. If Manila is included in urban transportation comparison with big Asian cities, Manila will likely excel if the main metrics is the number of traffic enforcers and officers on government payroll, not the length of rails and multi-level roads (interchange, tunnel, skyway) constructed and properly maintained. There are various options for urban mass transportation that the MMDA, LTO, LGUs and other agencies should consider, spend money there instead of hiring more traffic officers who will harass and penalize more motorists with various prohibitions that they have enacted (see Table 2). The Bus Rapid Transit (BRT) is the cheapest system and has been proposed in both Metro Manila and Metro Cebu but only the latter seems to have prepared for it. MRT/LRT are more expensive but they are faster and can transport more people per hour than BRT. 1. Allow the current Point to Point (P2P) buses and vans to go to more destinations. Not just SM North to Makati City and Ortigas or BGC. Rather, allow them to pick up passengers from Pasig City, Marikina City, Taguig City, Malabon City, Navotas City, etc. and crisscross to more destinations. 2. Allow the air-con vans to pick up passengers from many subdivisions and villages to various destinations. Commuters will avoid riding tricycles and jeepneys, the most inconvenient urban transportation system and among the major reasons why many people drive their cars just to avoid riding these small vehicles. 3. Allow fare deregulation in buses and vans so that more transport operators will field more modern and convenient vans and buses. They can charge higher fares but lower than driving a car, riding a taxi or uber/grab car. Less modern buses and vans will be forced to charge lower to attract more passengers. 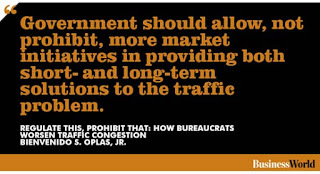 Government should allow, not prohibit, more market initiatives in providing both short- and long-term solutions to the traffic congestion problem. Make people’s commute convenient and safe, “one ride” as much as possible. And many people will leave their cars or motorcycles at home and jeepneys and tricycles will slowly die a natural death. Bienvenido S. Oplas, Jr. is the head of Minimal Government Thinkers and a Fellow of SEANET. Both institutes are members of EFN-Asia.